I’m so excited to share destination wedding tips and advice from 53 REAL brides I’ve featured right here on Destination Wedding Details. These ladies have seen it all: so they’ve stepped up to offer the good, the bad and the ugly when it comes to lessons learned during THEIR destination wedding planning process. I like to think of it as a list of destination wedding hacks! Obviously planning a destination wedding is a very unique experience and you’ll have to jump through some interesting hoops… I mean, you are not only planning a wedding but a vacation and honeymoon too. Oh and it’s not just a vacation with you and hubs, it’s the whole family + your friends. Plus, you’re likely not even going to see a single thing in person until the week you arrive on site – so that can up the stress factor, for sure. One of the obvious difficulties lies in the great distance between yourself and your wedding destination. Sometimes a language barrier or time zone difference can make communication that much more difficult. Being prepared by knowing what to expect and how to overcome these hurdles before they bamboozle you is KEY. And there’s tons of great advice here so that you are as prepared as possible. But as someone who had a destination wedding herself here’s my advice: This will probably be the first and last time you’ll ever take a vacation with a group of your closest family and friends to celebrate such a magical event like your own wedding. So, enjoy it. I always find that its appropriate to invoke the late, great, Maya Angelou… but for this occasion, one quote stands out among the rest as it relates to keeping your head right during the destination wedding planning process: “People will forget what you said, people will forget what you did, but people will never forget how you made them feel.” Simply put… don’t sweat the small stuff (manicure, centerpieces, cake), and just revel in this once in a lifetime experience! PS – all brides (myself included) will agree… don’t skimp on the photographer. Memories fade, but photos last a lifetime! You want to enjoy the wedding vacay as much as your guests, so find a great local planner. Someone you trust, who gets your sense of style, can help you find local vendors, and who can manage all of the wedding activities. For those who are planning to get married outdoors – remember that you can’t control the weather! Have a good backup plan (or two) and someone you trust who can execute that backup plan. Go with your heart. If a destination wedding is what you feel is right for you as a couple then do it. Don’t worry about what everyone else thinks. You will be surprised who actually supports the choice. And lastly, pick a destination that is special and means something to you both. With or without a wedding planner, the great thing is that friends & family want to help you out. So feel free to delegate small tasks or involve others so that you aren’t doing it all. Know what you want and what your priorities are. For example, there will be endless options and ‘add-ons’ and decisions to make during the process. Know ahead of time which elements are the most important to you (e.g. photographer, flowers & music). It’s funny – I always thought it was a cliché when I heard other brides say that their wedding was the happiest day of their lives. Now that I’ve experienced my own epic love bubble, I get it. You are surrounded by your favorite people, who are there for no other reason than to celebrate your love and commitment to another human being. It’s truly one of the most beautiful things you can experience. So, do yourself a favor and don’t stress about the small things. At the end of the day, no one is going to remember if you walked a little too quickly down the aisle, or if your manicure wasn’t the perfect shade of pink. In the end, all anyone seems to remember is how happy you looked and how much fun they had. Don’t worry about all the details. They will all work out. Just focus on the important things- for us that was having our family and friends all in one spot. Don’t let the little things stress you out! If you are working with a coordinator, you’re in good hands. They do this for a living. Let them do what they do best and relax. Also if it’s possible, take an extra-long vacation. Stay a couple days after your guests leave to relax and enjoy each other. That would probably be the only thing I would change about my destination wedding. Have fun. And make sure your guests know how much you appreciate them flying the distance for your special day. Any wedding day is crazy in the first place, but a different location adds another layer of craziness on top. We can’t stress enough the importance of surrounding yourself with supportive and helpful people. We were so fortunate that our friends and family ensured all the last minute details were finished in time. They kept us sane through the stress of the wedding day. We suggest the bride and groom select a few aspects of the wedding (photos, décor, dress, cake, etc.) you would like to prioritize your destination wedding. Take the time to ensure these core aspects of your wedding are exactly what you want and be flexible with the hundreds of other details of your wedding. This will save you time and stress. Take the recommendations of the event staff at the venue. Not only their preferred list but also what each one has to offer and what they recommend. And enjoy it! Most people won’t notice if something is missing or went wrong. 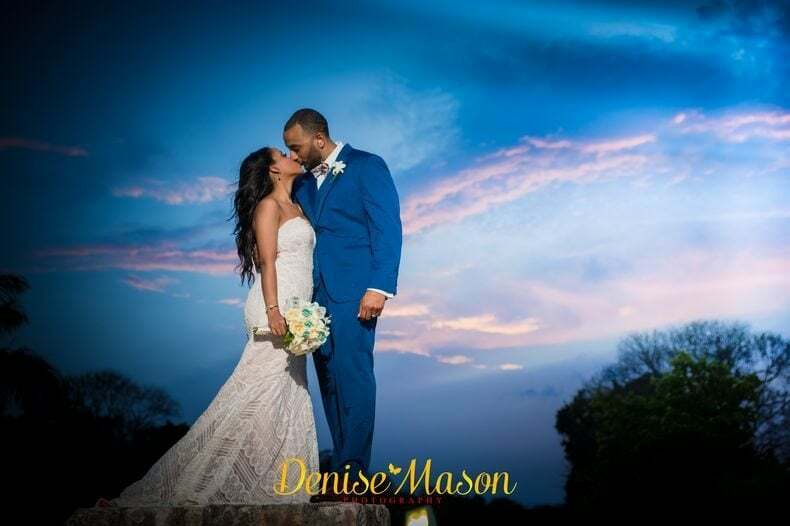 A destination wedding also allows you to enjoy your spouse on that day and night rather than running around to all the guest since you have already spent so much time with them. Bring any medication you can to help offset any possible health issue that may arise in a different country. And of course remember to have as much fun as you can, and remember to stop and take it all in! The day will fly by, so make sure you sit back and take it all in. Enjoy the day and trust that everything will go according to plan. If something does go wrong, chances are, you are the only one who will know. Don’t spend your whole day stressing out – it will be over before you know it, so enjoy! Do not get consumed by the details. No matter how hard you try, things will probably be different than expected. Don’t forget what the day is about. By going with an open mind, I let myself have an amazing day. We would not have changed a thing! Do your research, have a plan, and be organized! That’s the best advice I can give. Also if something doesn’t pan out, it’s not the end of the world. There will always be a hiccup, it’s all about how you handle it. You’re on vacation, enjoy every minute, even all the craziness and remember that it’s all about you and your groom and the beginning of your lives together. My best advice is to keep it simple and make the day about you. Use the many wedding websites and planning tools out there to assist you. It makes life a lot easier. But be sure to have a clear vision of what you want before you start planning- it will help keep you focused and on track. There is so much out there, it can be overwhelming sometimes. Plan it with a LOT of time and keep a very detailed agenda. It took us around 10 months to get everything ready so we had a perfect wedding. And consider the time of the year. Be accepting and patient. Accept that not all of your guests are going to be able to make the journey with you, no matter how far in advance you let them know. Be patient with your guests and your coordinators. We had some guests decide to join our wedding days beforehand (while we were in Cancun!) However, we were lucky enough to make the additional accommodations with our coordinator, which was amazing. You also need to remember that these coordinators have additional weddings that they are also working on, however, they are keeping track of your wants and needs. We would sometimes go a week without hearing from them, but once we did, they would answer all of the questions that we had leading up to their response. BRING YOUR PHOTOGRAPHER WITH YOU! It is so worth the money to know that you already trust the person taking your wedding photos. Pick a place you can visit yourself before deciding, and meet and bond with your planner. It was hard to arrange accommodations for all my Australian guests. Everyone had different plans. Some people stayed few days, other people stayed a week or more. It was time-consuming looking at venues in Sicily that could suit everyone’s needs. I would definitely recommend using a wedding planner or a good travel agency. I put some much time and heart into planning this wedding and wanted everything to go by perfectly. We did a lot of things on our own and tried to personalize every detail. I learned that all this dedication and personal attention pays off in the end. Not because every detail was covered and there were no glitches – because a few definitely did come up – but because I felt so much pride and happiness as the wedding week unfolded. Everything fell beautifully into place and it was so rewarding to see all our guests have such a wonderful time and knowing that I was responsible for much of the organization. I would tell any other bride to get involved in the planning as much as they can and to involve their fiances as well… it makes the wedding day (or week!) that much sweeter! Do everything early and give yourself time to do research and get organized. I had a binder and had all my vendors organized as well as alerts on my phone for appointments and payment due dates. I would definitely recommend making a weekend trip to view and meet potential vendors in person. With all the photo editing that is available, it made me so much more comfortable knowing first hand what I was choosing! Don’t underestimate the number of guests – who isn’t up for a vacation?! If you want a big crowd, plan during summer months. Many people made it their family summer vacations. We brought all of the decorations with us, and while it was a lot of packing and hauling, I’m so glad we did because it was beautiful and saved money. Think of the wedding from your guest’s perspective. Where to stay, how to get around, all those small details. People will have a lot more fun if they aren’t stressed getting there or have an awkward lag time in the middle of the day they don’t know what to do with. When things go wrong on the day, and they always will to some extent, do your best to take a breath and ask someone else to take care of it, if necessary. Then go back to being present in the moment with your spouse. It’s never too early to get started. You may think you have a lot of time for things, but the list grows exponentially as the day gets closer so anything you can tick off is worth doing straight away. Hire a wedding planner and don’t rely solely on your venue’s event coordinator. A wedding planner works for you and will be your right hand. My planner, Kelly, was instrumental in helping me make decisions, find the best vendors and she knew all of the Key West quirks, like having us switch sides for the ceremony so my hair and veil weren’t blowing in my face! Even if you only get someone for “day-of” coordinating, you and your family will be much happier not having to wrangle vendors and worry about details so you all can relax and enjoy your vacation. As hard as it may be, you HAVE to do what you as the couple wants. Make sure that every element of your wedding is a reflection of you. At the end of the day, all of your guests are there to support you and your nuptials so stay focused on that. They want to see you happy. Definitely do a first-look. It was so incredible to take those moments to ourselves to just enjoy each other. It also allowed more time to spend with all our guests during cocktail hour instead of taking wedding pictures. Line up your vendors early and get price confirmations and details in writing. Find a checklist online to help you figure out all the things you need to plan for, as well as to guide you on the best questions to ask each vendor. Make sure you do what you want. At the end of the day, the only thing that matters is you and your partner. When we told everyone we were having a destination wedding, we ended up having the worst backlash you could imagine and it really affected some of our relationships with friends and family. BUT at the end of the day, it’s about what we wanted and could see for ourselves. We are very happy we decided to go with our gut and continue with our destination wedding. It will go very fast and to be honest I do not remember a lot of the day. Just try to take in little moments and hold on to the feeling of amazing joy and love that everyone there has for you and your partner. Try and extend your vacation as long as you can. We had everyone come down for one week. It was so nice to be able to spend such precious time with them. Once everyone left, we moved to another resort for another week, honeymoon style. We really recommend this as it gave us much needed time alone to really relax and enjoy each other. Take your time deciding which resort you will have your wedding at, it’s one of the biggest decisions for the wedding! Plan ahead and ask for specifics from onsite and offsite vendors regarding payment and worst case scenario plans. Make sure that you keep hard-copies of receipts and emails on hand at your destination location because paperwork does get lost! Get a videographer! The day flies by and you’ll be happy you had it on video so you can relive it. This is a once in a lifetime memory so make sure to hire great entertainment (music, dancers, DJ etc)! Don’t stress about it. Whatever happens that day, happens. You may feel like you’re too far away but trust in your wedding coordinator that she will get the job done. Get a good and well-reviewed wedding planner that lives at the wedding destination. It will save your sanity and relieve some stress. And you will still be stressed…LOL. The most important thing I could say to future brides is, try not to stress too much. 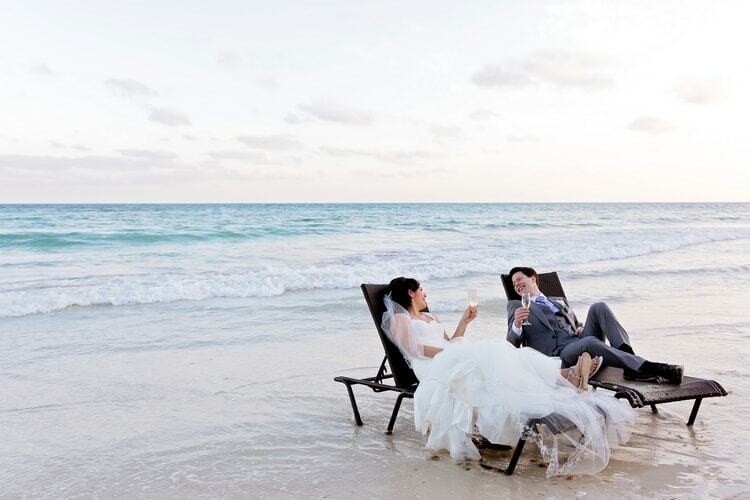 Getting married in Mexico is a little more difficult because everyone is on “beach time”. I wasn’t able to communicate with my coordinator over the phone, just email. I thought that I wasn’t well prepared, but when it came down to the day, everything turned out perfect! HIRE A WEDDING PLANNER! I cannot stress it enough. Venue coordinators/planners are definitely amazing and important to the day. But there is SO much a planner does to plan, coordinate with vendors and on the day-of that you can’t even anticipate, especially with the distance. If you are putting so much energy, money and time into one amazing day, the added cost of a planner is seriously worth it. My advice to all brides is to do what you and your fiancé want. Don’t be afraid to speak up and ask for clarity, or request to make changes. This is your day, don’t forget to enjoy the moment. It is true what they say that it all goes by so quick so make sure that you take a moment during the day to really sit back and take it all in. Hire a photographer that is local to the area or one that has experience shooting in the location of your wedding. This will ensure that all of the hard work you put into planning your beautiful wedding is captured perfectly and exactly how you envisioned. Do your research and really try to see the resort and meet with the staff beforehand. Our photographers, florist, and DJ we hired outside as the resort was charging a significant amount more for what we felt were less quality. Be sure to ask who every vendor is and don’t be scared to challenge the resort or wedding planner. It’s your day and wallet! Let go of the ‘plan’ when the day comes. Just be in the moment and enjoy the day. My seating chart and some little details went out the window with the weather being unpredictable. But everyone managed to still find a seat at the reception and enjoyed themselves. It worked out better than what I had planned. The best advice we can give is to decide what you care about and don’t get stuck on all the small details you don’t really care about. All we wanted, was to have was a low-stress day and great photos to remember it by. We focused on finding a great photographer, clothes, hair, makeup, and a nice venue for dinner with our guests. Keep it small and simple if you can. It’s much less stressful that way. We had a total of 15 adults and a few kids and it was fantastic. Everyone made a vacation out of it, did their own thing, came together for the wedding day, and then we all went home. Start planning everything way ahead of time so it doesn’t all pile up at the end. Choose your bridesmaid wisely – the last thing you want is unreliable people that will add to your stress. I was so lucky and feel so blessed to have had the support system that I had and I will always love and appreciate my girls for being so amazing throughout! Choose your vendors wisely. Don’t go rushing into making deals and signing contracts before you thoroughly vetted each vendor and confirmed that they each align with your style. I suggest paying for a videographer to capture the moment. Our video is amazing…looks like a mini music video.